Omega views watchmaking as an art, and has for the past 160 years. Omega innovators have enhanced the world of watchmaking with their creations, continually astounding us with new technology, marking a solid place for themselves in this industry. From the early days Omega’s brilliant artisans produced some very special movements, like the Calibers 19”, 1894. This renowned caliber, ingenuously designed by Francois Chevillat was described with one word, “perfection”. The blueprint of this famous design has lived on, and been used by the world’s finest watchmakers. Thought to be the final step in watchmaking technology, at the time, the movement was named after the last letter in the Greek language, and from there, the Omega name was born. 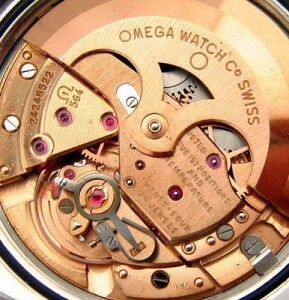 The Omega movements that Chevillat went on to create were as beautifully adorned inside as the watches were outside. The Omega 19” Grade DDR was developed in 1905. It was equipped with 23 jewels, including diamonds and rubies. This silver/nickel movement had diamonds atop the barrel arbour, and a cross end and stop stones, which were diamond set. 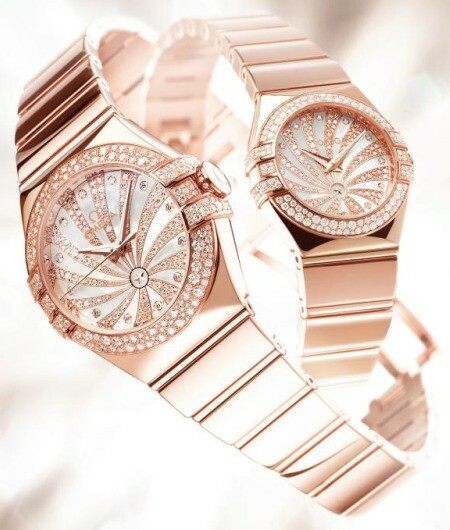 Along with the diamonds and rubies, the movement was crafted of gold, with gold collets and balance screws. Of course, these designs were only the beginnings of what would be a long and legendary history, which makes up Omega. 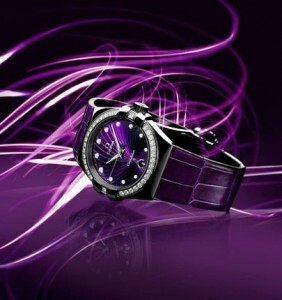 Omega watches, perfect. When it comes to men’s watches, there is nothing that says “serious watch” more than Omega watches. The company behind the watch that was worn on the first moon landing has done it again. Omega’s 50th Anniversary Speedmaster is an exact replica of the watch of the watch that NASA supplied to each of the Apollo astronauts. It is even manually wound, just like the original. This watch sold quite well between 1957 and 1966 as the Omega “Speedmaster” and later as the “Speedmaster Professional”. Today’s Omega watches offer up the latest generation of amazing precision and ruggedness, just like they always have. Take the Omega Speedmaster, for exa mple (Ref. #311.33.42.50.01.001). This men’s watch has is made of stainless steel and has a manual winding mechanism at its heart. It is exactly like the one worn on the moon, and is even engraved with the NASA emblem, noting its flight qualification for all manned space missions. This chronograph is distinctively masculine and quite powerful as well, with a 12-hour, 30 minute and 1/10 of a second subdial and rugged steel construction. Its domed, anti-reflective case is scratch proof and water resistant up to 100 meters, and the large round case gives it the look and feel of a navigator’s watch, complete with a tachymeter on the bezel. In 2009, Omega watches went out with a bang. The company secured a gig to sponsor the Olympic Winter Games (starting in February) and updated the Constellation collection for women, one of its only offerings of jewelry watches. The new Constellation series (pictured here) are beautifully decorated, with diamonds adorning the bezel, dial, hour markers and being part of the “supernova” pattern. The bracelet as well became smoother and more seamless; this being one of the principal characteristics of Omega Constellation watches. The cases are made from gold, two-tone, or stainless steel and color options range from steel to purple, champagne and black and white, while sizes vary from 24, 27, 31, and 35, to 38mm. Cindy Crawford, an Omega Ambassador since 1995, has always promoted women’s watches from the Constellation collection and is frequently seen wearing one; so it made sense that Omega would raise this collection to be its flagship women’s watch. In keeping with a largely popular style trend to emerge from 2009, Omega now offers this watch with a rubber strap (seen in second image). Matching diamonds and rubber is a hot new look, allowing the watch to be fancy yet cool / casual at the same time. Prices for these new watches range from a couple thousand of dollars all the way to $15,000, for the top of the line models. 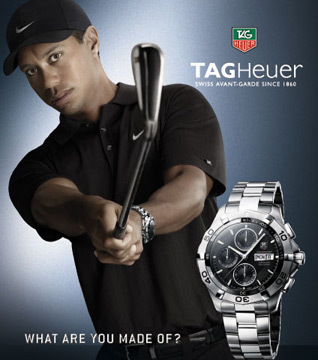 TAG Heuer and Tiger Woods were once a match made in heaven. TAG Heuer is a luxury watch brand that has been creating a strong brand of sports watches and chronographs since 1860 and Tiger Woods is the best golfer in the world. But due to the growing scandal surrounding Tiger’s infidelities it may be that TAG and Tiger are no longer. Tiger’s endorsement deals are what have made him a rich man; he’s worth a reported $1 billion dollars. Aside from his athletic gift he has always been attractive to sponsors because his image has been so clean cut. On the TAG Heuer official website it clearly makes this connection saying: “it is both his character and his achievements that make Tiger Woods unique. His personal obsession with results and perfection, his ability to withstand pressure, to meet expectations and exceed them, but also his love of discipline – all this makes him a natural partner for the brand.” Will TAG dump Tiger? The question remains. Gatorade, another sponsor of Tiger’s, has already pulled the plug and people are taking note that commercials featuring Tiger are not being aired. In fact, the last time a Woods ad aired during prime time was November 29 (two days after his now famous car crash); the commercial was a 30-second spot for Gillette. A comparable incident happened with Michael Phelps when he was photographed smoking pot; Omega watches stood by him when other sponsors like Wheaties (General Mills) dropped him. In hindsight maybe this was a bad move since people with the munchies may have ended up eating more Wheaties, “The Breakfast of Champions”. And who knows, during these times of declining watch sales, it’s possible that this bad press could actually up watch sales. There is a saying that “there is no such thing as bad press.” Perhaps TAG Heuer will look to Omega for advice on how to handle this delicate situation. UPDATE: Over the weekend TAG Heuer announced that it would stand by The Tiger during these hard times. Omega has a long history as being the official timekeeper of the Olympic Games and part of this partnership is that Omega has to come out with cool new designs every two years as well as open new boutiques so that people have actual access to Omega watches in whichever city is hosting the Olympic Games. These 2010 Games marks the 24th time that Omega is the official timekeeper. Next up are the Winter Olympics in Vancouver, Canada, hence Omega’s new and first storefront in this country. 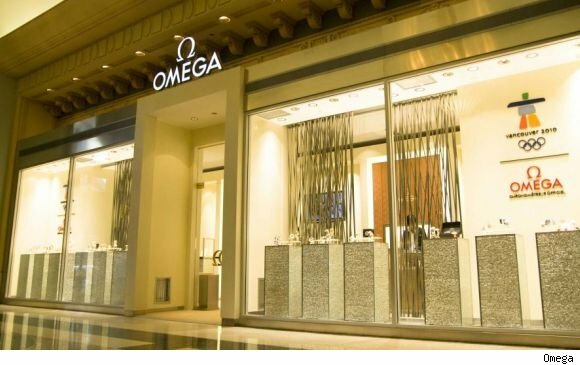 The store opened last Friday in the lobby of the Fairmont Hotel and features watches from $2,000 to as much as $400,000, but Omega brand president Gregory Swift expects the “heart” of the collection will be in the $5,000-to-$10,000 range. 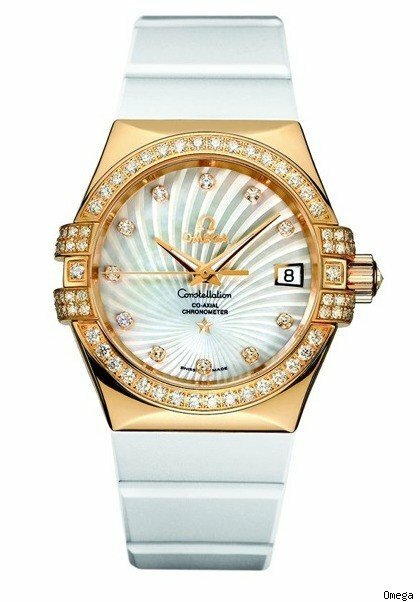 Included in this selection of Omega men’s watches and Omega women’s watches will be some limited edition Vancouver 2010 watches. 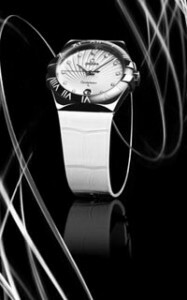 Omega also has a history of endorsing Olympic heroes and celebrities and making them Omega Ambassadors. The following people are likely to be in Vancouver promoting Omega watches: George Clooney, Nicole Kidman, Cindy Crawford, Michael Phelps, Sergio Garcia and Michelle Wie. Many luxury brands have abandoned the U.S. and European markets and have slowly but surely been heading into and expanding their business dealings in Asia and the Middle East. China and India are the new number one destinations; populations are large and the appetite for luxury goods is still growing. Watch brands like Raymond Weil, Tissot and Omega Watches have already arrived; opening new boutiques, hiring famous local Indian and Asian faces to promote their brands and seeing how this move is going to keep them in business. In India, Gucci has two stores; one in Delhi and the other in Mumbai but which sold a limited range of products. Last year the announcement was made that not only would the brand geographically expand, so would its product offering. In addition to opening a location in Bangalore, everything from Gucci men’s and women’s collections of ready-to-wear, handbags, shoes, Gucci watches and other accessories will be for sale. Gucci is one of the most recognized words, not to mention brands, in the world. The epitome of Italian luxury and the largest-selling Italian brand in the world, with the infamous GG logo (which stands for Guccio Gucci, the founder), Gucci anything is desired by many. Gucci watches are one the brand’s many products and are for those that foremost consider themselves fashionistas, will not be disappointed with a Gucci watch. With over twenty-four different collections of men’s and women’s watches, there exists the perfect Gucci timepiece for everybody. The Swatch Group is the world’s largest manufacturer of watches. 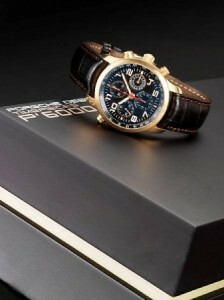 Under the group’s umbrella are 19 watch companies, including Tissot, Omega, Swatch, Breguet and others. Swatch used to operate a Tissot factory in Manaus, a free trade zone in the capital of the state of Amazonas in Brazil, but was forced to shut down because bribes were being demanded. However, now Swatch plans to re-enter Brazil and will be bringing $100 million dollars worth of investment. The timing of this decision could not better as Brazil was just awarded the honor to host the 2016 Summer Olympics. Nicolas Hayek, the man behind Swatch is scheduled to meet with Brazilian President Luiz Inacio Lula da Silva to discuss Swatch’s investment plans. Housing one of the largest populations in the world and by far in Latin America, Brazil is a great market with lots of buying power, especially for mid priced watches such as those by Swatch. It is also fair to say that Brazilians will be drawn to the fun, bright colors found in Swatch watches. 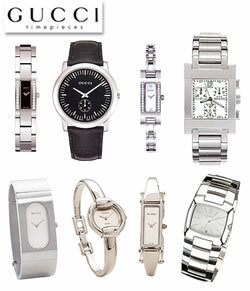 Other watches sold by brands owned by the Swatch Group, such as Omega and Tissot watches, will also do well in Brazil. The Swatch Group has a great reputation as a company to work for. In a survey conducted in Switzerland, 3,400 were asked about the image, profile, quality, innovation and emotional components of 112 different Swiss companies. Swatch Group came in at the top. It was just announced that the 2016 Olympics Games will be hosted in Rio. Omega Watches, part of the Swatch Group, also recently announced that it will continue to be the official timekeeper of the Olympic Games. Omega has pledged to invest more than $1 billion dollars into sports timekeeping over the next ten years. The $100 million promised by Swatch Group and the $1 billion promised by Omega is a lot of money, but surely this type of money is worth the advertising that Omega and therefore Swatch will receive in Brazil surrounding the Olympics, making it a win-win for all those involved.